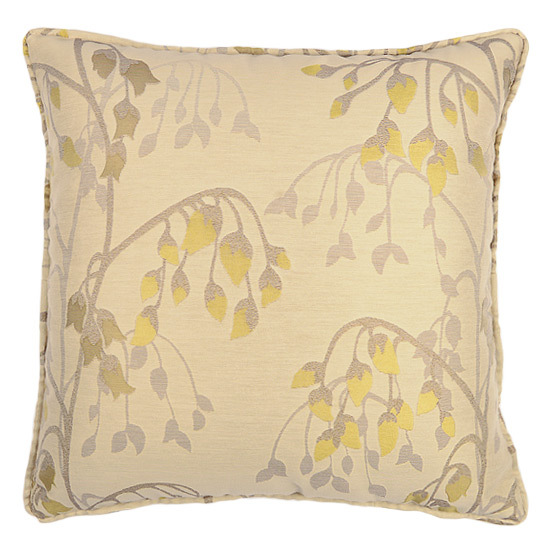 Elegant charming floral piped cushion design with grey and brown stems leading to silhouette leaves and small buds, shimmering yellow embossed drooping bell shaped flowers slightly glisten as they catch the light and adorn a light pale brown background. Feel the sense of an open valley meadow or quaint woodland forest in late spring early summer. Excellent standalone cushion or equity at home in a group or stack of cushion, looking for some contrast try combining with Chartreuse Puerile, Yellow Cushion to give a two toned effect. Product code: CW-WCC-43. Category: Willow Cushion Collection. Free UK delivery when you spend £50 and over on selected products. You will qualify for Free UK delivery on your order when you spend £50 and over on all non fabric products. Visit Delivery & Returns for more info. If you're not completely happy with your item, please contact us for a replacement or a full refund.